Heat oven to 400°F. In a medium sauté pan, over medium heat, sauté onions in a little hot olive oil 8-10 minutes. Add apples, 1 teaspoon Italian Herb seasoning, 1/2-1 teaspoon salt (to taste) and fresh ground pepper. Sauté ten minutes or until apples are tender. Stir in vinegar and vegetable broth. Heat through. 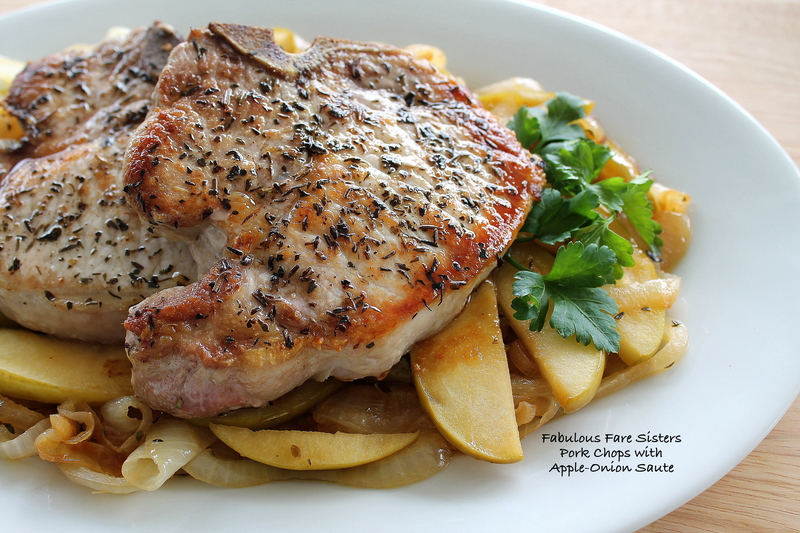 Meanwhile, season pork chops on both sides with salt & pepper and a dash or two of Italian Herb seasoning. Heat one tablespoon of olive oil in a large oven-safe skillet. 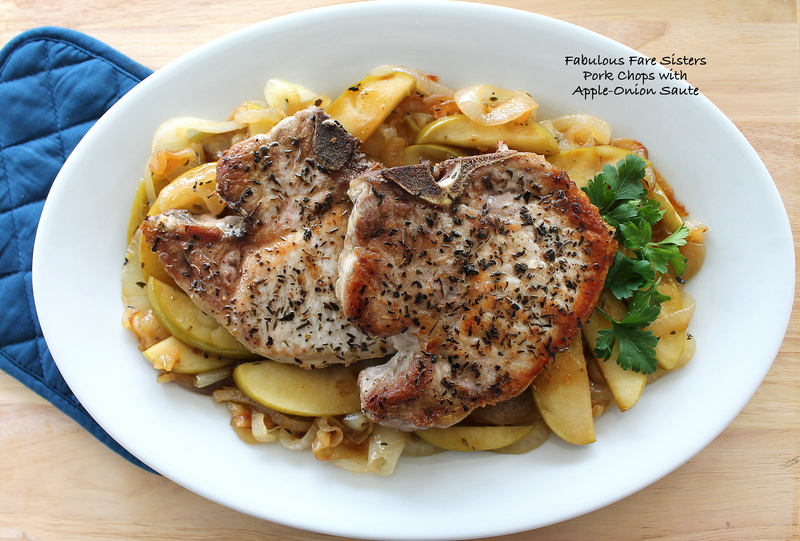 Add the pork chops and sear for 1-2 minutes on each side. Then place frying pan in the heated oven for about 5-6 minutes. 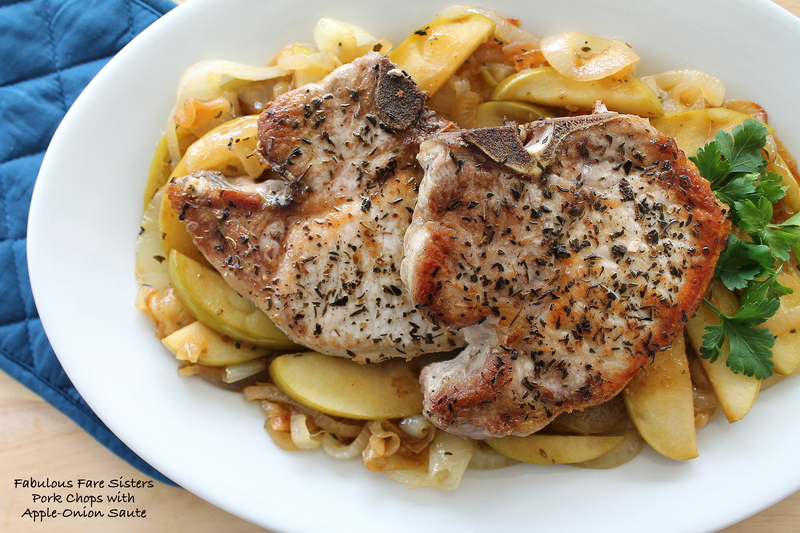 To serve: Plate the Apple-Onion Sauté on a serving platter and top with pork chops. Makes 2 servings. This recipe has been shared on Fiesta Friday – go check it out and then go visit other great sites! What a great stick to your ribs must have meal! Perfect for a snowy night before you go back out to finish up the shoveling!! Thanks for linking up to us at Fiesta Friday! Oh, my! That sounds amazing! I love the combinations of apple and onion together. It’s a great idea.